For moderate to heavy protection. 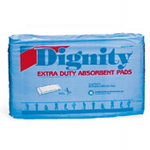 Use with Dignity garment or regular pants. Double pad made of fluff filling and a soft, non–woven covering. Pad can be cut for single use, or layered for triple protection. Pad size ; 4 3/4 x 12" (folded).